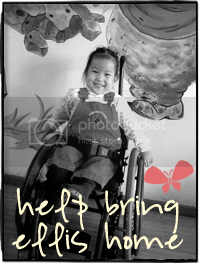 My wonderful, long-time buddy Kris recently got news that TA is on it’s way for her beautiful daughter, Ellis Gao Mei! Her fundraiser ends tomorrow, and she’s giving away some amazing stuff… go check it out! Just look at that precious face!! How can you resist? thank you SO much STEF!!! So glad everyone put the word out for Kris; she almost made her goal! We are trying an unusual approach to raise funds to bring our daughter home. Check out our blog at http://www.arrowinourquiver.blogspot. Please pray with us that it works!